This year Transition Tavistock is taking part in Grow Your Tenner, an annual match funding campaign run by Localgiving. 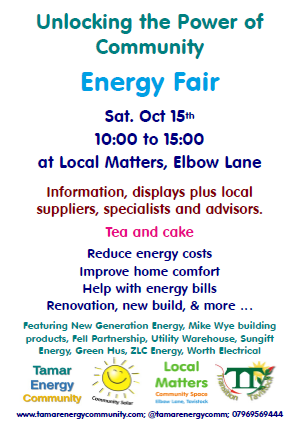 This is an amazing opportunity for Transition Tavistock. We encourage all of you to get involved in whatever way you can – be it as a fundraiser, a donor or simply by spreading the word. With the added incentive of your monthly donation being matched, it is the best time to set up a Direct Debit for our cause. A regular donation will help us to continue our work and our community space at Local Matters for the foreseeable future. To donate to us or find out more about Grow Your Tenner you can visit: https://localgiving.org/transitiontavistock. Grow Your Tenner 2016 will run from 10am on Tuesday 18th October until 5pm on Thursday 17th November, or until the money runs out. Remember, only donations made in this time will be eligible for match funding! We think the money is likely to run out this week, so please act quickly. We need to raise £4000 per year to keep our services running. This enables Transition Tavistock to pay for insurance and other general running costs, make a contribution to Local Matters rent, rates, utility costs and admin, and support initiatives run by our volunteers such as the growing projects from Roots to Transition and Tasty Tavy. Donating is easy, just visit localgiving.org/transitiontavistock, click on the ‘Donate Now’ or ‘Give Monthly’ button, enter you details and you’re all done! We would also like to thank the person who is already supporting us on a monthly basis. This is really welcomed and makes a big difference to us. This entry was posted in News on October 19, 2016 by Transition Tavistock. 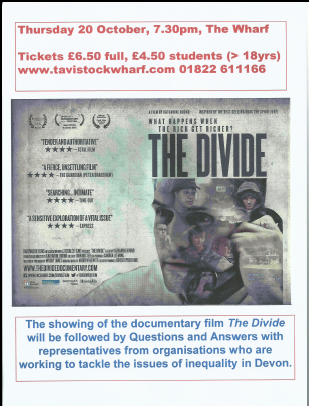 A must see film about social inequality, The Divide is showing at The Wharf this Thursday, 20th October, at 19:30, followed by a Question and Answers session with key organisations working to tackle inequality in Devon. Tickets available from The Wharf. This entry was posted in Uncategorized on October 19, 2016 by Transition Tavistock.